- Center-Column Reference System--with references based on key words, phrases, and concepts. - Large Print--clear, readable type. - Two-Column Text in Paragraph Format--for easy reading and comprehension. - Full-Color Maps, Study Helps, Book Introductions, and Concordance. - Words of Christ in Red. - Trim Size: 6" x 83/4" x 11/4"
NASB Reference Bible: Burgundy, Leather-Look, Giant Print, Personal Size by Zondervan was published by Zondervan in March 2001 and is our 17063rd best seller. 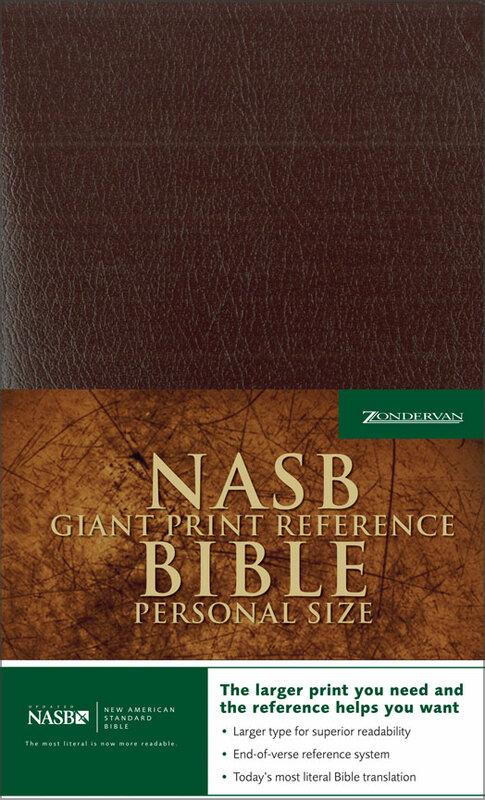 The ISBN for NASB Reference Bible: Burgundy, Leather-Look, Giant Print, Personal Size is 9780310916604. Be the first to review NASB Reference Bible: Burgundy, Leather-Look, Giant Print, Personal Size! Got a question? No problem! Just click here to ask us about NASB Reference Bible: Burgundy, Leather-Look, Giant Print, Personal Size.